When old school hooks up with new school, watch out. 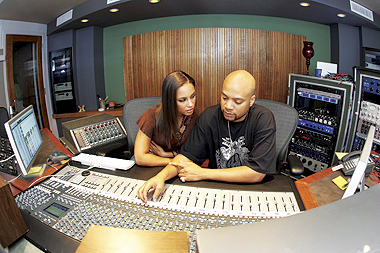 That's exactly what has happened at The Oven Studios, a world-class facility created for Alicia Keys and Kerry “Krucial” Brothers, founders of KrucialKeys Enterprises (www.krucialkeys.com). 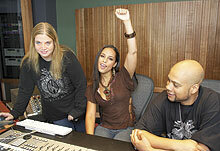 Designed by Keys, Krucial and a dedicated team, the facility successfully builds on a pre-existing high-level recording studio in the New York area and puts it into a 2005 context, perfect for a nine-time Grammy®-winning songwriter growing increasingly skilled in her role as a producer. After the smashing success of Songs in A Minor and Diary, KrucialKeys decided that a purpose-built recording studio was in order, with a choice between renovating an existing facility or building one from scratch. Realizing that vibe settles in like a vintage wine, the partners opted for the former and purchased an established facility built into an old house, with a quiet town setting and calming shade trees just outside. KrucialKeys got the process going by huddling with longtime engineer Ann Mincieli, who started working with the pair at New York City's Quad Studios in 2000 — a relationship that officially went full-time during the recording of Diary. Mincieli did her research and built a tight, top-tier team capable of guiding the studio's extensive renovations and rebirth: Krucial; Keys; Dave Malekpour of Professional Audio Design; and John Storyk, Beth Walters, Dirk Noy and Chris Bowman of architectural and acoustical design firm Walters-Storyk Design Group. “Everyone's input went into it,” Mincieli stresses. “Everything in the pre-existing structure would lead us to ask, ‘Why do we need that? How do we revolutionize this? How do we change the face of the industry? How can we be a leader ourselves?’ We had the team, and if you look at the rooms, they're from everybody's input and decisions. It was nice because someone else would frequently have a way of looking at things that you might not have thought of. Adding to the 230-square-foot control room is a wide selection of mic pre's, including the 24 ultralow-noise preamps in the AWS900, plus four more external SSL mic pre's, 16 additional channels of API and two original Neve 1073s. The highly flexible SSL patchbay was custom-made by PAD for The Oven, laid out to maximize integration between the console and the 24-in/48-out Pro Tools|HD system, while keeping all cables concealed via an under-the-floor routing scheme. The Augspurger and Yamaha NS10 monitors, multiple mics and myriad other gear build on a perfectionist attention to detail within the recording space, sporting a matched look with Aston Martin Metallic Silver 2001 paint selected from a local car dealership. Everything is set up to capture the magic that awaits in the adjoining live room, a 535-square-foot space with a stone wall and a staged floor plan created especially for Keys' vocal and piano mastery. “The pianos in that big live room have such a clear, crystal, gorgeous clarity,” Keys says. “At the same time, we can set up anything else we want. It has the stones on the wall that gives a more intimate, personal feel. The point of the room is to capture a multitude of sounds.” Also on The Oven floor are a 160-square-foot drum room and 80-square-foot iso booth. Studios A, B and C combine to make The Oven a full-service facility — not just for KrucialKeys, which recently mixed Keys' Unplugged here for J Records, but for their collaborators and select outside clients such as Donna Summer and Keyshia Cole. Especially enticing is the Pro Tools|HD3 — equipped Studio B, where dark wood and natural light combine to create a naturally meditative state and an extremely attractive destination for writing, recording and pre-production. Studio C offers a complement of Korg and Roland synths and Akai MPC workstations to add to the available sonic palette. According to Malekpour, The Oven is a perfect example of the direction that accomplished artists are now taking with their personal facilities. “At PAD, what we've seen happen is a shift from larger-scale commercial facilities to artists wanting their own larger-scale personal-use facilities. They're built around a person's way of working, and they want to be in there without the clock ticking so that even if they go away for two weeks on tour, they can get right back to working the way that they want to work. “This studio has ramped that up: It's a pro facility that's privately owned, and they've considered how to use it for session work when they're not using it themselves,” he continues. “I won't be surprised if we replicate this kind of studio in the future: a mid-sized room with great acoustics and everything in the control room within easy reach designed around production and creation as opposed to having this giant object there. The SSL AWS900 has such a small footprint that it allows you to do a lot more. David Weiss is Mix's New York editor. 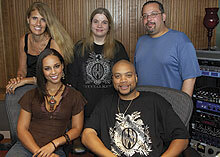 © 2006 Prism Business Media Inc.